We’d love your help. 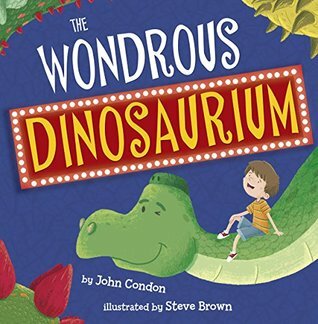 Let us know what’s wrong with this preview of The Wondrous Dinosaurium by John Condon. To ask other readers questions about The Wondrous Dinosaurium, please sign up. What young child would not love the prospect of picking a dinosaur as a pet? My two loved seeing which dinosaur Danny would pick, and it was a great point of discussion - lots of interaction during reading. The secondary character of Mr Ree is wonderfully eccentric, and it made delightful listening as he described the types of dinosaurs on offer. Overall, this is a great picture book for young boys and girls - a fun, different angle on dinosaurs. My son LOVED this book. It also reminded him that he has wanted a pet lizard for a very long time now and would really love to get one after reading The Wonderous Dinosaurium as he now thinks if a lixard is too hard to mind he can just swap pets heehee..quite a nostalgic feel to it. Great read for kids Great book . What a cute story! How fun it would be if we could go and chose a dinosaur to be our very own pet? A nice little moral of how sometimes we need to go through many choices before ever finding the right one! Beautiful illustrations, and being a teacher, I know kid would engage and just love this story. This wonderfully fun book is full of colour, humour and action as a boy tries to choose which dinosaur to have as a pet from Mr Ree's mysterious Dinosaurium. I love the fact that the dinosaurs are technically accurate even though they are drawn with bags of personality. Great for fans of Dear Zoo. A bright and delightful tale that every dinosaur loving child will adore! And if they don't love dinosaurs already they will once they've heard this story. Fun and quirky book which brought back memories of my daughter desperately wanting a guinea pig. A fun romp through the dinosaur ranks! Who wouldn’t want to visit a pet shop that sells dinosaurs?? Fab illustrations and a fun story make this an entertaining read. We loved it at #picturebookclub too!